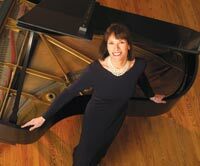 Susan Spelius Dunning is more than a concert pianist, she is also an educator and supporter of the musical arts. Her performance at the Sun Valley Pavilion on Sunday, July 17, at 6:30 p.m. is a benefit concert to support the Sun Valley Artist Series educational outreach programs and the Sun Valley Artist Series winter concert series. She will play on her own 9-foot Steinway grand piano on the pavilion stage. The show will begin with a pre-concert talk by Frederic Boloix at 6 p.m.
"It's an hour of music accessible to everyone," Dunning said. "I will talk between each piece." Dunning said it's very important to her to connect younger generations to classical music, and she encourages young people to attend. Admission for music students and teachers is free. Tickets for all students are $10, general admission is $30, reserved seating is $100 and patron seats, including a terrace champagne reception after the concert, are $250. Tickets are available at Ketchum bookstores, www.svwas.org or by calling 725-5807. Dunning's classical music piano performance is in celebration of the 200th anniversary of the birth of Franz Liszt. The performance will also include works by Mozart, Chopin, Debussy and Rachmaninoff. "I have practiced up to eight hours a day for this incredible opportunity," she said. "I'm rocking and hot." Her performance will be in memory of Dex Gannon, a Blaine County resident who died early this year at the age of 21. Dunning said the Sun Valley Artist Series is not a symphonic series—it's for solo performers and small chamber music groups. The Sun Valley Artist Series has launched several free education programs this year, including a Great Composers Lecture Series, Educational Outreach, Pre-Concert Lectures and the Robert Greenberg Lecture Series in conjunction with The Community Library. Dunning was raised in Chicago, where she performed her solo piano recital debut at the age of 16. Her first solo orchestral appearance was at the Grant Park Pavilion in downtown Chicago. She was the recipient of the prestigious Amelita Galli Curci Foundation Award and received numerous scholarships from the Three Arts Club of Chicago. Her teachers in Chicago included John Suter and Dolores Fredrickson. Dunning received a bachelor's degree from the American Conservatory of Music in Chicago and went on to receive a master's degree from Colorado State University, where she studied with Dr. Janet Landreth. Dunning continued her studies in the doctorate of musical arts program at the University of Colorado. Dunning later studied in San Francisco with the renowned Hungarian concert pianist Sari Biro, who, she said, had a significant influence on her performance career. She went on to receive high critical praise for her solo piano and orchestral appearances. Even at an early age, Dunning appeared on radio and television broadcasts, and she was the featured soloist for a critically acclaimed public broadcasting documentary produced by San Francisco-based Melchor Productions. Dunning served on the faculty at College of the Canyons in Santa Clarita, Calif., for nearly a decade, and she had a private piano studio in Los Angeles, where she taught and coached numerous award-winning students. Her recent solo appearances have included performing lecture-recitals in Europe and chamber music concerts throughout the Western United States and Hawaii. During her most recent European tour, she performed in Scotland at historic locations in Loch Lomond, Nairn, and Wick. Dunning recently recorded a solo CD featuring works by Rachmaninoff, Khachaturian, Schumann and Chopin. Dunning lives in Sun Valley and Perugia, Italy.